Homeowners ask if it is safe to use treated lumber for garden beds. While there is scientific consensus that it is safe to use for garden beds, the information below explains what chemicals are used in Viance Ground Contact treated wood for residential use and the results of numerous scientific studies. The American Wood Protection Association (AWPA) specifies the use of treated lumber for horticultural purposes to be Ground Contact. In the AWPA Book of Standards, copper azole (CA) and alkaline copper quaternary (ACQ) are listed preservatives for Ground Contact use in residential applications. CA and ACQ are both available from Viance under the brand name Preserve. CA and ACQ preservatives contain copper, the primary fungicide and termiticide in Viance’s ground contact product. The fungicide prevents soil fungus from attacking the lumber and works to deter insects, including termites. Copper is also a common fungicide for food crops used by consumers for growing vegetables and is a disinfectant in swimming pool chemicals. Of interest to the home gardener is whether or not any of the preservative components in treated wood used to construct a raised bed garden could render the food crop unsafe for consumption. The available evidence suggests no. John Harrison, President of JRH Toxicology, a consulting firm specializing in scientific advice to the industry and government, writes in 2017 that CA and ACQ have been carefully evaluated for safety and registered by the Health Canada Pest Management Regulatory Agency (PMRA) for use in residential construction applications. He stated in a bulletin titled, Treated Wood in Raised Bed Gardening, “Scientific evidence and data have shown that using pressure treated wood for raised bed or box gardening is safe to adults and children in terms of the plants grown and used in these containers.” He further explains, “All chemicals in consumer products have a toxicity and most are very low, so they are not a problem, especially those regulated by the federal government. This is also the case with currently registered wood preservatives that contain copper. In fact, small amounts of copper are necessary for human and plant life and termed “an essential trace element”. Dr. Scott Leavengood, Associate Professor College of Forestry at Oregon State University and Director of the Oregon Wood Innovation Center authored an article for the OSU Extension Service, titled “Raised bed lumber, pressure treated safe?” In this article, Leavengood gives his opinion that the consensus among researchers is that the low levels of chemicals in preservative treated wood that leach out of the wood into the soil are likely to be taken up by the plants only in very small amounts. There has been no evidence to suggest that the level of the chemicals is significant enough to be of concern for human health. In a 2014 study, wood research scientists Love, Gardner and Morrell at Oregon State University found that in growing radishes, carrots and potatoes in a copper azole treated Douglas-fir planter, the copper levels were not higher in roots or tubers of radishes, carrots or potatoes compared to beds constructed from untreated wood. They also state that when people are concerned about the migration of wood preservatives, they can use polyethylene (plastic) to line the inside of the planter. Their scientific results indicate that although plastic lining is “not entirely necessary”, it can be used if there are safety concerns. The use of a plastic barrier will also extend the life of the preserved wood and help keep the raised bed garden soil within the bed area. 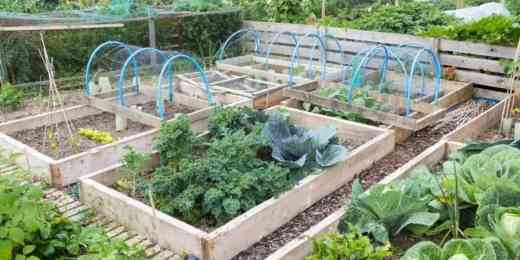 For proper drainage, the plastic material should not be used underneath the raised bed garden. Safe practices for working with treated wood recommend treated wood not be used where it may come into direct or indirect contact with drinking water or a component of food, animal feed or beehives. The USDA prohibits treated lumber for soil contact use in their certified National Organic Program published in 2011. The updated draft dated September 5, 2018 states that CA and ACQ are not currently allowed because they are not included on the National List of allowed synthetic materials (7 CFR part 205, page 425). Viance recommends for those who have concerns to line the interior walls only with heavy plastic sheeting. There have been no justified claims that today’s treated lumber causes any negative effects from leaching into the soil. Love, Connie & Gardner, Benjamin & J. Morrell, Jeffrey, (2014) Metal accumulation in root crops grown in planters constructed from copper azole treated lumber European Journal of Wood and Wood Products. 72. 10.1007/s00107-014-0789-5. Researched by Edie Kello, Director of Marketing, Viance, LLC published February 18, 2019.